"The twin Covenants of Bahá'u'lláh and of `Abdu'l-Bahá"
"The potentialities inherent in the station of man, the full measure of his destiny on earth, the innate excellence of his reality, must all be manifested in this promised Day of God." 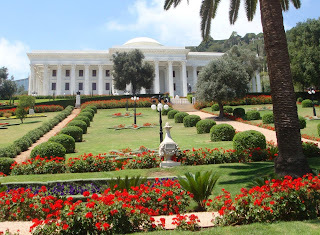 The Guardian of the Baha'i Faith, Shoghi Effendi wrote through his secretary, "The Faith of Baha'u'llah constitutes, indeed, the stage of maturity in the development of mankind." In earlier dispensations there were fewer responsibilities: Matters of faith, of personal integrity, of committing oneself wholly to God, and sharing and living by the Word of God, to be sure. Mere recognition of the Manifestation was acceptable in those Days; but not in this Most Glorious Day. The Bab revealed this new standard of spiritual maturity to His Letters of the Living: "The days when idle worship was deemed sufficient are ended. The time is come when naught but the purest motive, supported by deeds of stainless purity, can ascend to the throne of the Most High and be acceptable unto Him." We have emerged from our earlier religious garbs, we have the high privilege of having recognized the Manifestation of God in His new garment. "How high the reward of him that hath not ... failed to recognize the beauty of his Best-Beloved in this, His new attire," Baha'u'llah writes. Before becoming Baha'is, we looked ahead toward the great responsibilities that would come with accepting Baha'u'llah - the same obligations as before, but with new types of responsibilities: Higher moral standards, new laws, the obligation to build a divine world order, the duty to associate with and to truly love people so very different from ourselves, to carry on all of the religious duties previously held by paid clergy; and not only that - but also to face the opposition and the indifference of a world that does not want to mature. We appraised this great burden -- and we accepted it. We took the first step, and declared ourselves believers. And we are among the very first generations to strive to live by this most weighty revelation, and to receive "new bounties" for doing so. We receive extraordinary blessings for being among the first to recognize this light - but with each blessing comes a great responsibility, and we stagger under it. "We must always look ahead and seek to accomplish in the future what we may have failed to do in the past. Failures, tests, and trials, if we use them correctly, can become the means of purifying our spirits, strengthening our characters, and enable us to rise to greater heights of service." "He is very happy to see that you have put into practice one of the most encouraging precepts of 'Abdu'l-Bahá in which He said that we should try and make every stumbling-block a stepping-stone to progress. In the course of your past life you have all stumbled very gravely; but, far from being embittered or defeated by this experience, you are determined to make it a means of purifying your natures, improving your characters, and enabling you to become better citizens in the future. This is truly pleasing in the eyes of God." We cannot give up, the Revelation is too rich a gift, the opportunity for each of us to benefit multitudes of souls is too great a favor to refuse. But we need to give ourselves some time to adjust to our new clothes. The Guardian's guidance is: "We must not only be patient with others, infinitely patient!, but also with our own poor selves, remembering that even the Prophets of God sometimes got tired and cried out in despair!" If we stick with it, He assures us that we will grow. "What every believer, new or old, should realize is that the Cause has the spiritual power to re-create us if we make the effort to let that power influence us, and the greatest help in this respect is prayer. We must supplicate Bahá'u'lláh to assist us to overcome the failings in our own characters, and also exert our own will power in mastering ourselves." "I testify that no sooner had the First Word proceeded, through the potency of Thy will and purpose, out of His mouth, and the First Call gone forth from His lips than the whole creation was revolutionized, and all that are in the heavens and all that are on earth were stirred to the depths. Through that Word the realities of all created things were shaken, were divided, separated, scattered, combined and reunited, disclosing, in both the contingent world and the heavenly kingdom, entities of a new creation..."
"Darkness hath encompassed every land, O my God, and caused most of Thy servants to tremble. I beseech Thee, by Thy Most Great Name, to raise in every city a new creation that shall turn towards Thee, and shall remember Thee amidst Thy servants, and shall unfurl by virtue of their utterances and wisdom the ensigns of Thy victory, and shall detach themselves from all created things." And in that deranging, that reorganizing and sometimes disconcerting creative process, we look for stays, we look for solid ground. Our Lord has provided the solid ground of His laws, His guidance, and His House of Justice which He guides on this earth. "You should rest assured that your strict adherence to the laws and observances enjoined by Bahá'u'lláh is the one power that can effectively guide and enable you to overcome the tests and trials of your life, and help you to continually grow and develop spiritually. The Guardian particularly appreciates the fact that you have been faithfully observing Bahá'u'lláh's injunction regarding the recital of the daily obligatory prayers, and have thereby set such a high example ... These daily prayers have been endowed with a special potency which only those who regularly recite them can adequately appreciate. The friends should therefore endeavour to make daily use of these prayers, whatever the peculiar circumstances and conditions of their life." Is the Authority of the Universal House of Justice Limited to Legislation? What is Unique About the Covenant of Baha'u'llah? Is there provision in the Baha'i Writings for the Universal House of Justice to function infallibly with only its elected membership? Is the Universal House of Justice in the Line of Successorship? Is the Universal House of Justice Authorized to Function without the Presence of the Guardian as its "Sacred Head"? In What Spirit Should a Believer Turn to the Universal House of Justice? Why is Obedience to the Covenant so Important? What did Shoghi Effendi mean by "Divorced from the Institution of Guardianship the World Order of Baha'u'llah would be Mutilated"? Must the Guardian of the Cause be a Descendant of Baha'u'llah? What was the Authority of the Hands of the Cause of God to Lead the Baha'i Faith? What does Abdu'l-Baha mean, that the "Executive must Aid and Assist the Legislative Body"? What Unmistakably Proves that Charles Mason Remey was not a Guardian of the Cause? What "Covenant" Have Covenant-breakers Broken? Study of Baha'u'llah's "Epistle to the Son of the Wolf"
No copyright is claimed to any publication quoted or linked to on this website.